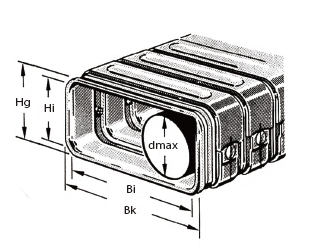 CF101 is square-shaped flexible conduit. Please indicate the correct coupling (flange) style for customization. Please see the attached chart for better understanding of all coupling/flange style options. Material: Stainless steel & PA (nylon) lining. 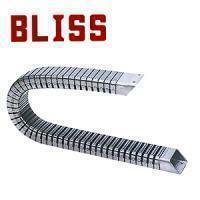 Fastening: Flanges are welded to both ends of the flexible conduit to insure electricity continuity. Fixed at the middle: Total length = stroke / 2 + 4 times bending radius + 50 mm. Fixed at single side: Total length = stroke + 4 times bending radius + 50mm. Size selection: To determine interior size, a 30 ~ 40% allowance should be added to the outside diameter of the enclosed cables to prevent binding. Bending: It's better to choose by 8-10 times of the outside diameter of total enclosed cables for selecting the bending radius. Security guarantee should be in the limit of 60 ~ 70% of capacities, it will be artificial improper disposal if out of this limitation. Suggest to install the support holder to extend the life of using.